Bishop Phil Whipple is prayerfully considering who God’s man for this hour would be for the Shoreline Church. Your prayers are appreciated during this transition not only for the Shoreline Church, but for Pastor Steve Fish. Fonda Cassidy, from the Mt. Olivet UB church in Mt. Solon, Va., is currently in Haiti with a Samaritan’s Purse team. She sent this report on October 26. The Hatiian people are in the midst of a crisis with outbreaks of cholera. Our first day of clinic on Sunday was only treating cholera. Really critical patients were placed on gurneys and IV’s started. I am happy to say that a lot of the IVs I brought were used in the first day! There were times when someone would come running with a very limp and emaciated body. I believe in all my travels it was the first time I have encountered cholera.They have profuse emesis that they describe as “rice water,” and that is exactly what it looks like. Each time as people of around 30 per room would vomit, or have diarrhea, we would have a cleaning lady come and mop. Do you know what it is like to mop on an old cement floor? We were wading through it! They brought in white boots for us to wear. We were told not to touch our face. They set up hand washing stations with bleach water. I put a mask on even though cholera is not air-born I was afraid I would be accidentally touch my face. Mid-day now, it is very hot! We saw young and old alike go on to meet their maker. That was the first day! Now today the third day of clinic, our cholera team actually saw fewer patients. CNN has been here and interviewed Samaritan’s Purse several times, We have seen planes come in with supplies. It is exciting to be witnessing for the Lord. We have rejoiced with many who have received Christ. We have pastors that will be following up with each patient. Today the clinic where we were working saw 131 patients, and we had 7 first-time converts. I saw a lady who was 53. After I examined her, she looked at me and smiled and said, “I want to receive Christ into my heart!” What a true blessing. Also, I was excited today to talk by phone to the United Brethren pastor who is in charge of the work here in Haiti. He is coming tomorrow to see me here in Citi Soilel. I tried 2 times yesterday to get in touch with him but no ringing of the phone. Today the phone rang–he answered and he is coming tomorrow–so I am hoping to get to see our Haitian churches tomorrow! Rev. Warwick Fuller has been selected as the first associate pastor in the history of Crestview UB church (Lafayette, Ind.). Warwick holds a Master of Divinity from Evangelical Theological Seminary in Myerstown, Pa., and will soon be ordained in the United Brethren church. Warwick and his family–wife Heather and three daughters–are natives of Harrisburg, Pa., where they currently live. Heather is a high school science teacher. First UB Church of Lansing held the closing service on October 24. I have been praying that it would be a time of celebration, remembrance and most importantly of God’s faithfulness. Beginning with the first Sunday of October, Theron Smith gave us a brief lesson on the History of the United Brethren denomination. The next Sunday he gave us a lesson on the history of First United Brethren Church of Lansing. It was incredible to hear how the city of Lansing contributed to clearing the lot that the building is built on. R. E. Olds donated funds toward the building, and a local bank donated the original chandeliers. You could clearly see how God’s hand had been in the starting of First UB Church. On the third Sunday of the month we were introduced to Pastor Tim Flickinger, former pastor of Fowlerville UB (Fowlerville, Mich.), who will serve as church planter/restart pastor to begin a new UB church in Lansing. In preparation for the closing service, several invitations were sent to people who have moved on and to those who have not been in church for a long time. As a result, over 100 people attended the last service. Each of the living pastors were contacted, and most of them sent letters highlighting their time at First UB. Rev. Harold Cherry, Rev. Kevin Cherry, and Rev. Connie Cherry were also in attendance. 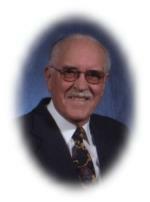 Harold and his family served the church 1959-1969. They all shared some of their memories. Much of the service was opened up for people to share their memories and to express their thanks to individuals. Many people shared special music. The service was closed with Pastor Kevin Cherry praying for the Hergert family and their future, then Pastor Theron Smith prayed for the children in the church and for their future as well. It seems clear to me that God has been working through the closing of First UB to benefit the kingdom through the new work in the Lansing area. The people of the church have been very open to this, plan and the issues of timing make It evident that God has been and continues to be in charge. James E. Sturgeon, 72, of Rockford, Ohio passed away Friday morning, October 22, 2010, at his residence in Rockford, Ohio. He was a member of Praise Point UB church in Wilshire, Ohio. Before entering the ministry, Jim worked for Chrysler 1956-1970. He graduated from Huntington University in 1974, and from its Graduate School of Christian Ministries in 1975. New Hope UB (Huntington, Ind.). He presided over the relocation of the church, initially called Etna Avenue UB church, to its present location. Surviving are his wife, Joann Sturgeon, and three children. Visitation: 11 am – 2 pm and 3-8 pm Sunday, October 24. Also, 1 hour before the funeral on Oct. 25. Visitation Location: Zwick & Jahn Funeral Home, 520 North Second Street, Decatur, Ind. 46733. Funeral: 2 pm Monday, October 25. Wes Kuntzman officiating. Funeral Location: Praise Point Church, Wilshire, Ohio. 555 Decatur Rd North, Willshire, Ohio. Every year Camp Malvern hosts the Jamaica Conference summer youth camp. At this camp over 100 youth attend and many give their souls to Jesus; others rejuvenate and strengthen their commitment to the Lord. Many other spiritual retreats and functions are also held at Camp Malvern. The camp site is now in urgent need of repairs and development. Work teams from the United States will come to Jamaica in January and February in a 50/50 collaborative effort to develop Camp Malvern. Since the beginning of the year, fundraising efforts in Jamaica have raised substantial funds for Camp Malvern. On October 17, at the Jamaica Conference midyear conference, the ”UB Torch” was launched. The UB Torch is a four-foot-high replica of our logo with a large square in the middle, which holds the development plans for Camp Malvern. Members who made contributions can sign in the square around the development plans of Camp Malvern. Today’s report begins with thanksgiving and praises! Mamei has overcome the setback that happened last Thursday. The pneumonia is under control, she is off the breathing machine, and she is smiling and interacting with us and the nurses. She was alert because they took her off the sedatives. It was such a pleasant sight to come in last night and see her sitting up, smiling, and giving the nurse a hard time! Jeff Bleijerveld, Director of Global Ministries, is in South Africa attending the 3rd Lausanne Congress on World Evangelization. He sent this note on October 20. We were majorly challenged in this morning session’s. John Piper spoke on Ephesians 3 emphasizing that prayer and suffering are normative to the spread of the gospel and fulfilling the eternal purposes of God. This was followed by testimonies about people who have lost their lives for the gospel in Iran, Saudi Arabia, and Afghanistan. The story from Afghanistan was shared by the widow of a man who died along with 11 others just two months ago. To say I was overwhelmed by their faith is an understatement. I’m going to be processing some of this for a long while. I don’t think I’ll read Ephesians 3 the same way I have in the past ever again. We focus on the last verse — immeasurably more — and think in terms of what God will do for us. In reality it refers to what he wants to do in us to bring us in line with His cosmic purpose of bringing salvation to all who would otherwise be nothing more than objects of wrath. In Paul’s world, and the world of the majority of believers where the church is growing, this will always take place in the context of prayer and persecution, not prosperity. 20 Oct New Youth Pastor in Camden, Mich.
Tim Gorniak was hired as the new youth pastor at New Hope UB (Camden, Mich.). He holds a local license from Shoreline UB church in Oak Harbor, Ohio. Don Gentry is the senior pastor at New Hope. Dr. G. Blair Dowden (right), as president of Huntington University, is automatically the Director of Higher Education. Here are some tidbits from his written and verbal report to the Executive Leadership Team on October 12, 2010. 148 students in the EXCEL Adult Degree Program. 90 students pursing master’s degrees in the HU Graduate School. There are students from 35 states. 33 international students represent 20 countries–the largest grow of international students in at least two decades. The incoming class of 320 new fulltime students was the second largest in the university’s history. The number of new Untied Brethren students increased from 28 in 2009 to 35 in 2010–the highest number of new UB students since 2002. The UB church is consistently the largest single denomination represented in the student body. The Campaign for Huntington University is approaching the $10 million mark toward an overall goal of $21 million. Renovations are currently underway in Becker Hall (the former Administration Building) to create new classrooms, studios, and labs for the Digital Media arts program. New bleachers were installed in the Merillat Complex–the first of many planned renovations. US News: #8 among the Best Baccalaureate Colleges in the Midwest Region, and #5 in the Best Values category for Baccalaureate Colleges in the Midwest. Forbes.com: Among the top 15% of colleges in the United States. Princeton Review: on the “Best in the Midwest” list. Washington Monthly: one of the Top 50 baccalaureate colleges in the nation. HU hired 7 new faculty this year. Of the 60 fulltime teaching faculty, 48 (80%) hold earned doctorates. Huntington University is gaining a greater presence in Fort Wayne and northeast Indiana. Significant on-air and off-air promotion of HU has developed through a strategic alliance with Fort Wayne Christian radio station Star 88.3. The number of students form Fort Wayne has increased. HU made significant progress on several diversity initiatives. United States ethnic minorities now comprise 5% of the student population. In 2009-2010, the university community had a year-long emphasis on diversity. Book studies, chapel program, special guest lectures, and other activities centered on the theme “One in Christ” explored racial reconciliation as an outgrowth of our Christ-centeredness. State funding was cut 31% last year and another 7% this year.